(Bloomberg Opinion) -- Skeptics of Representative Alexandria Ocasio-Cortez's promise of a Green New Deal were worried that the plan would be a Trojan Horse for unrealistic and ruinously expensive economic proposals that have little to do with stopping climate change. The unveiling of the plan gives them more reason for worry. Ocasio-Cortez's Green New Deal appears to take every big spending idea that has emerged on the political left in recent years and combine them into one large package deal, with little notion of how to pay for them all. 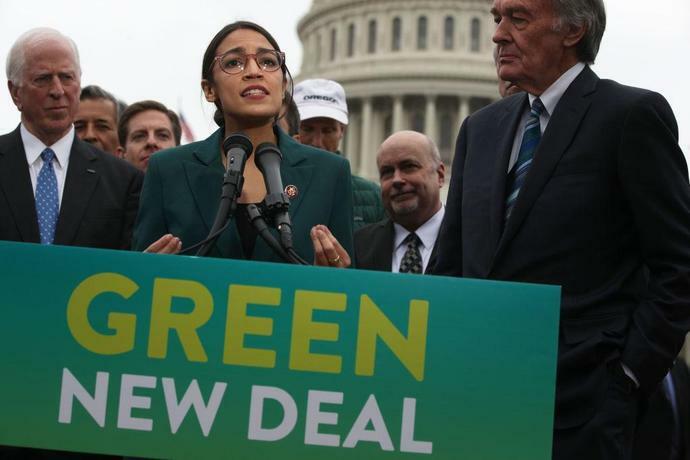 The Green New Deal as introduced to Congress is in the form of a non-binding resolution laying out a series of goals. The wording of the resolution is ambitious, but vague. More concerning are the details of an online FAQ that appeared on Ocasio-Cortez's website but was later taken down. The FAQ contained important details that are not included in the resolution itself. On Twitter, Ocasio-Cortez's chief of staff, Saikat Chakrabarti, referred to the FAQ as a "bad copy," and promised to release a revised version. But the original FAQ may give insight into the Ocasio-Cortez camp's true goals. And it shows that although the Green New Deal bills itself primarily as an environmental policy and jobs program, the most expensive items are enormous new entitlements paid for by unlimited deficit spending. First, to be fair, it's important to discuss the good ideas in the plan. The Green New Deal would retrofit all American buildings and factories to be carbon-neutral, electrify all transportation, and switch the entire electrical grid to carbon-neutral energy sources. These goals are highly ambitious, but they're good targets. Ocasio-Cortez's plan correctly recognizes that carbon taxes wouldn't be enough to prompt private companies to do all these things on their own, and that large-scale government-funded infrastructure is required. Furthermore, a focus on scaling up clean energy would push the technology forward. That would help other countries - where most of the world's carbon emissions are produced - to follow in the U.S's footsteps. 1. "a job with family-sustaining wages, family and medical leave, vacations, and retirement security"
2. "high-quality education, including higher education and trade schools"
4. "safe, affordable, adequate housing"
5. "economic security to all who are unable or unwilling to work"
The plan thus appears to combine a federal job guarantee, free college and single-payer health care. Depending on how one interprets the guarantee of "economic security" to all those who are "unwilling to work," it might also include a universal basic income - something that was mentioned in an earlier Green New Deal proposal. The guarantee of universal affordable housing is, to my knowledge, new. How much would these proposals cost? It's hard to know. Senator Bernie Sanders' Medicare for All proposal was predicted to cost about $3.2 trillion a year. Switching to renewable energy would conservatively cost more than $400 billion annually. Even though the cost is coming down as technology improves, net-zero emissions retrofits of every building in the country would be expensive - optimistically, perhaps $88,000 for a townhouse, and presumably much more for free-standing homes. Assuming $100,000 per home, that comes to about $1.4 trillion a year over a decade. Factories, office buildings, stores, etc. would cost much more per building, but there are far fewer of them - about 5.6 million. If each one costs $500,000 to retrofit, that's about $300 billion more per year. For universal basic income, the cost has been estimated at $3.8 trillion a year. A narrower program that only covered, say, one out of three Americans who are "unable or unwilling" to work, it would cost about $1.3 trillion. By comparison, free college would be cheap at about $47 billion a year. Affordable housing for the entire nation could cost a lot, depending on what that means, but let's ignore that for now. So this quick, rough cost estimate - which doesn't include all of the promises listed in the FAQ - adds up to about $6.6 trillion a year. That's more than three times as much as the federal government collects in tax revenue, and equal to about 34 percent of the U.S.'s entire gross domestic product. And that's assuming no cost overruns - infrastructure projects, especially in the U.S., are subject to cost bloat. Total government spending already accounts for about 38 percent of the economy, so if no other programs were cut to pay for the Green New Deal, it could mean that almost three-quarters of the economy would be spent via the government. And all this is assuming that repurposing essentially all of the nation's economic resources doesn't cause any loss in economic efficiency. History and the experiences of other countries suggest that this wouldn't be the case. Most troubling, the Green New Deal's FAQ sidesteps the question of how to pay for the plan. It simply links to two op-eds explaining so-called modern monetary theory, or MMT, which posits that deficits don't matter all that much in the absence of inflation for those countries that issue their own currency.This suggests that the Green New Deal will be paid for with soaring deficits, which could be quite dangerous. The plan's environmental spending proposals would be temporary, but the new entitlement programs would be permanent. If MMT is wrong, and if ever-expanding deficits cause runaway inflation, the result would be a devastating collapse of the nation's economy. Hyperinflation has never happened in the U.S., but then again, neither has anything like the Green New Deal. A wholesale breakdown of the U.S. economy wouldn't do much to arrest climate change, nor would it provide an enviable example to the rest of the world, upon whose emissions reductions the planet's future actually depends. So although a big push for renewable energy is needed, the Green New Deal's vast program for economic egalitarianism could make it unworkable. Let's hope the FAQ doesn't represent the final version of the plan, and the sweeping proposals for economic restructuring - especially basic income - can be dropped in favor of a tighter focus on reducing carbon emissions. But if the now-deleted FAQ represents Ocasio-Cortez's true plans, the answer to the question of "Do you support the Green New Deal?" will have to be "No."